Back to the desert and to such a recognisable and iconic plant, Taxon of the Day is wondering if it is possible to say anything enlightening about it. Perhaps it is almost enough to show one, to remind everyone both what the Catalogue of Life is all about and what a beautiful and striking plant it is. Especially when viewed in its stark, native landscape, it creates mad shapes and vistas that are both surreal and unique in equal measure. Endemic to the Mojave Desert (that crosses California, Utah, Arizona and Nevada) but perhaps with its greatest density in the self-titled Joshua Tree National Park, Yucca brevifolia Engelm. has many attributes of a tree - a trunk with branches, leaves, flowers and fruit. And it is these unquestionable similarities that have informed a number of its common names including the widely used Joshua Tree. However, it does not fit into either a coniferous or deciduous variety and is classified as a monocot in the plant family Asparagaceae. As such it does not have growth rings, thus making it difficult to estimate the age of one. Yet it is known that they can survive hundreds of years, if not thousands. Its branches can be extremely variable in habit, but generally go up and out, which is how it came to acquire the first part of its common name, where Mormon settlers who named it, thought it resembled Joshua from the bible, raising his arms up in supplication. Local indigenous peoples have their own names of course and have made use of the plant for food and materials for centuries. 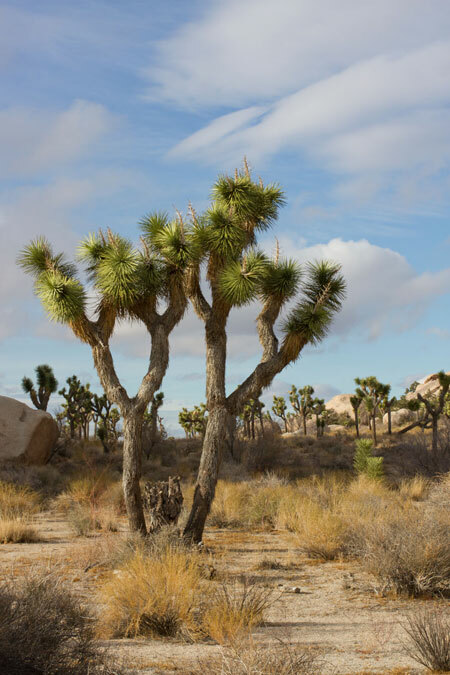 Yucca brevifolia is an indicator species for this desert region and as such it has had a relative amount of attention in terms of the potential impact of climate change, with declining numbers already recorded in hotter areas. Documenting biodiversity, including completing a list of all known species names is a priority if we hope to have the best tools to deal with these changes. Whether global warming is a factor, or other environmental influences, perhaps the most interesting recent event for this plant was that 2013 has gone on record as one of the greatest years for flowering, with blooming Joshua Trees in great abundance over most of its range. What a wonderful sight to have seen first-hand.